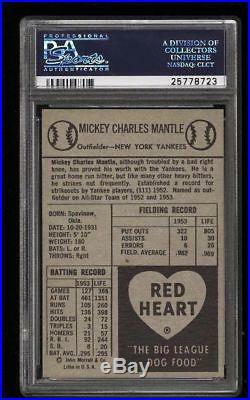 1954 Red Heart Mickey Mantle PSA 3. Card's eye-appeal exceeds it's grade. With very good centering and fairly sharp corners. It would not look out of place in a 5+ case. 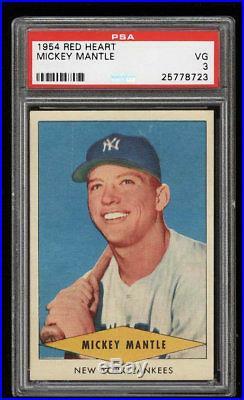 The item "1954 Red Heart Mickey Mantle HOF PSA 3 Centered & Undergraded" is in sale since Tuesday, October 17, 2017. This item is in the category "Sports Mem, Cards & Fan Shop\Sports Trading Cards\Baseball Cards". The seller is "cardboard-picasso" and is located in Dallas, Texas. This item can be shipped worldwide.